An Afghan man accused of overseeing a reign of terror in his home country has been arrested following an investigation by Scotland Yard, it has been reported. Zardad Khan is being held at Paddington Green police station in west London while a decision is made on whether to charge him under laws forbidding torture, according to The Independent newspaper. A Scotland Yard spokesman said: "Early in the morning of 14 July officers from the Metropolitan Police anti-terrorist branch re-arrested a 40-year-old man at residential premises in Streatham, south London. "That was in connection with an allegation of serious crime." It is understood that Mr Khan was arrested on 10 May this year by Scotland Yard anti-terrorist branch, but was released on bail until August. BBC London correspondent Tom Edwards says officers from Scotland Yard have been to Afghanistan to gather evidence. Mr Khan operated roadblocks at a town called Sarobi, on one of the major routes into the Afghanistan capital of Kabul, during the early 1990s. In July 2000 the BBC's Newsnight programme tracked Mr Khan to Mitcham in south London. When questioned by Newsnight he denied doing anything wrong. "We never harassed anyone, and we never killed anyone," he said. "I was not the commander at Sarobi. I was a commander at Kabul. I was just an adviser at Sarobi." When the Taleban took over, Commander Zardad had enough money to escape to Britain. "I come here to England because we have lots of trouble because the Taleban are trying to kill me and make trouble," Commander Zardad said. "I am not doing anything in England, I am just living my life." 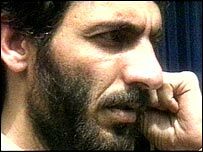 He claimed he joined the mujahideen at 17 to fight a jihad, or holy war, against Soviet forces which had invaded his country in 1980, and rose to command about 2,000 men. According the Independent, he has been running a pizza parlour in Bexleyheath, south-east London, for three years.